Responding to the open dataset of proposals, Rucker composed an epic poem that served as the backbone of the project. 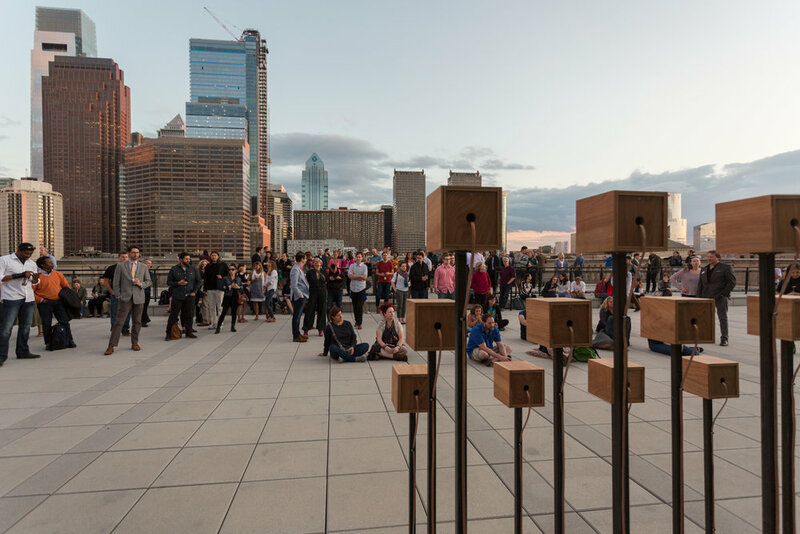 Each Sunday, visitors were invited to experience a special weekly listening of a multichannel sound installation on the Skyline Terrace atop the Free Library of Philadelphia’s Parkway Central branch. The composition included the sounds of Rucker’s poem and a special choral arrangement of Louis Gesensway’s “Logan Square at Dusk” from Four Squares of Philadelphia. Visitors were also able to hear the sound monument at solar-powered listening stations around the square, where they could plug in their headphones. Partners: Mural Arts Philadelphia, The Pew Center for Arts & Heritage, The City of Philadelphia, Philadelphia Parks & Recreation, the Free Library of Philadelphia, and Friends of Aviator Park. Logan Squared: Ode to Philly was presented as a part of the Monument Lab: Philadelphia (2017) exhibition. Logan Squared: Ode to Philly © 2017 Emeka Ogboh. All rights reserved. All poetry © 2017 Ursula Rucker. All rights reserved. Logan Square at Dusk from Four Squares of Philadelphia by Louis Gesensway © 1972 by Theodore Presser Company. All rights administered by Carl Fischer, LLC. All rights reserved. Used with permission. Choral arrangement of Four Squares of Philadelphia: “Logan Square at Dusk” prepared with original score of Four Squares of Philadelphia provided courtesy of the Edwin A. Fleisher Collection of Orchestral Music at the Free Library of Philadelphia. I have explored the historic and aural infrastructures of various cities—Lagos, Nigeria in particular—through my sound recordings and installations. These works try to understand cities, mostly through sounds they generate in the form of soundscapes, but also through audio materials found in the city’s archives, and in some cases, through entirely new compositions inspired by the cities. My proposed work for Monument Lab intends to explore the city of Philadelphia through the concept of collective memory. Herein, I am interested in how Philadelphia remembers (or forgets) its past, and how over time these collective memories have been passed from one generation to the next. The point of departure for this work begins with what the city of Philadelphia remembers and what it choses not to remember in terms of its history. The question is put across its citizenry in the form of research feedback, either online or offline (website feedback or real-time data collection), and then the resultant feedback is processed. The idea is to create a musical composition for an orchestral/choir performance from the research feedback. This feedback will either inspire a composer to work with me in creating a new musical composition, or provide us with data that is converted into a musical score. This can be achieved by running the resultant data through an analytical software. The final composition would be performed by a choir ensemble. I am interested in working with a choir ensemble. The musical piece will be performed by the orchestra/choir and recorded on separate channels for the individual voices and instruments. These recordings will be re-installed as a multi-channel sound installation in a public space. Emeka Ogboh’s works contemplate broad notions of listening and hearing as its main focus. He transposes, inserts, and installs sounds in diverse locations to contemplate compelling issues surrounding migration, globalization, and post colonialism, amongst other topics. His sound recordings also consider the history and aural infrastructure of cities, Lagos, Nigeria in particular. These Lagos recordings have produced a corpus of work entitled “Lagos Soundscapes,” which he has installed in different contexts. Ogboh has begun to explore audio archives, a recent interest in history, and how nostalgia and memory intersect in the conceptualization of the present. He is also working with music composers in creating new audio works that open the listener’s ears to locating narratives that are often embedded in sounds. Ogboh is a 2014 DAAD (Deutscher Akademischer Austauschdienst) grant recipient, the cofounder of the Video Art Network Lagos, and the 2016 Prize of the Böttcherstraße in Bremen winner.